North Carolina requires that you be separated for a period of one year before being eligible to file for Raleigh absolute divorce. For example, if you separated on April 1, 2013, you are eligible to file for Raleigh divorce on or after April 2, 2014. Are you and your estranged spouse listed together on the title of any real estate, automobiles or other assets with a title? Are you and your estranged spouse co-borrowers on any loans, mortgages or credit cards? Does your spouse have a retirement account he or she heavily contributed to during the marriage (compared to your own contributions to your retirement account), whether or not it was created before the marriage? Was a significant amount of income earned during the marriage used to increase the value of your estranged spouse’s separate property? Are you the spouse carrying the larger percentage of debt that was acquired during the marriage for marital purposes yet held in your sole name? Are you the spouse who made less money or perhaps was not working during the marriage, and find yourself in a state of financial hardship because your estranged spouse is not providing financial assistance to you? 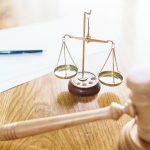 This is important to consider because once the Judgment for Absolute Divorce is entered, your right to file a claim for equitable distribution and spousal support (post separation support, alimony and related attorney’s fees) is barred, meaning you have no right to file these claims and have them addressed by the courts. 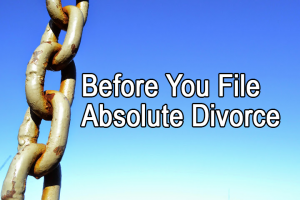 If you feel you may need to make one of these claims to have issues addressed related to your situation, you should consult with an attorney and get legal advice with regard to the best way to handle your situation, and they can assist you with filing a complaint for absolute divorce that also includes the claims you need to assert to preserve as well. As long as these claims are pending (have been filed with the court) at the time the Judgment of Absolute Divorce is entered, they are preserved for future adjudication by the courts. If they are not, you lose the right to pursue these claims. Please note that Raleigh child custody and child support are not affected by the entry of the Judgment of Absolute Divorce, but claims for equitable distribution and spousal support (post separation support, alimony and related attorney’s fees) are greatly affected. As a result, you should seek legal advice before filing a Complaint for Absolute Divorce to ensure that you do not need to preserve these claims for future adjudication to protect your legal rights. No one has all the answers for their divorce. That is why seeking the help of a divorce attorney is a wise decision for anyone. Give us a call at 919-301-8843 or complete the contact form below. 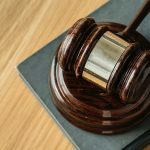 How Long Will My Divorce Take in North Carolina?